Creates unique and easy letters, resumes, selection critera responses, calling cards and interview cue cards. Promotes positive willing attitude and what the applicant can contribute. Highlights relevant skills, abilities and achievements. Excellent presentation with a variety of professional presentation styles. Unlimited combinations each customised to the applicant's age, personal circumstances and job preferences. Screen Preview saves time and paper. What employers want in job applications and at interviews. How to "sell" your relevant strengths and demonstrate a positive willing attitude. How to develop a "unique selling proposition" to highlight what you can contribute. How to be concise, consistent, correct and courteous. How to research job opportunities. How to follow-up job applications. Different approaches for solicited and unsolicited job applications. The user is first asked whether the application is in response to an advertisement (solicited) or is designed to explore an unadvertised job possibility (unsolicited). The program uses different selling arguments, depending on whether the application is solicited or unsolicited. With unsolicited applications, the unique suitability of the client for that particular organisation, as well as for that industry and job, must be promoted. The job application letter sections enable the user to select a unique combination of sentences for each of the four paragraphs ("show interest", "why me", "unique selling proposition" and "contact for interview"). These sentence options are tailored to the user's age, background, current situation, personal circumstances and the position for which they are applying. Sentence selections can easily be re-ordered, previewed and edited on the screen and changed. The letter can be saved to disk and transferred to a word processing document. The Resume section allows easy entry, re-ordering, screen previewing and editing. There is a large menu of selections for resume sections, including "personal qualities", "skills", "interests", "achievement words" and "job specific words". An "Enter Own" option is also available. There are a large range of Resume section headings from which to choose, which cover all backgrounds and age groups, plus an "Enter Own Headings" option. It is easy to re-order Resume sections so that the unique strengths and achievements of the applicant most relevant to the position are highlighted early in the resume. There are a choice of resume formats and styles. Applications which demand a response to specific selection criteria have been required for government positions since "promotion by merit" was introduced. The general principles of responding to 'essential' and 'desirable' selection criteria (or job requirements), however, apply to all job applications. 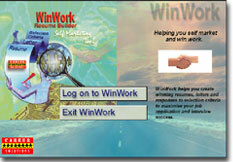 Winwork provides a wide range of selection criteria responses. These responses reinforce the client's demonstrated skills and abilities, and their relevance to the position; plus the positive outcomes of their contribution, and the resulting benefits to the organisation. Suitable for job seekers of all ages, experience and background. Creates an infinite number of different letter, resume and selection criteria documents. Variety of styles and formats. Letters, resumes and selection criteria quickly and easily created. Can be printed, stored on floppy or hard disk and/or imported into word processing packages. Screen preview option to save time/paper. Easy menu selection of options. No word processing training required. Self instructional program with in-built installation and operating instructions. Information and coaching on Letters; Resumes; Selection Criteria responses; Application Forms; Electronic and Internet Job Applications, Telephone Applications; Job Opportunity Research; and Job Search Follow-up. Unique Integration with all other CAREER SOLUTIONS Career Exploration and Guidance Tools. The program runs on any system that meets the minimum system requirements for Microsoft Windows (95, NT 3.5.1 or NT 4.0 or upwards versions). It also runs on most networks. It needs 15 Megabytes of hard disk space. It has been found that the best performance has been achieved on systems which meet the following minimum recommended specifications: 486DX2/66, 32 Mbytes of RAM. The CAREER SOLUTIONS documents should print on any printer which is supported by your Windows operating system. Best quality reports will be achieved using either laser or inkjet printers printing at a minimum resolution of 300 dots per inch. If using a laser printer, a recent model printer with fast internal processing is recommended. Within 48 hours (Australian capital cities) from receipt of a faxed or mailed Order Form (72 hours for regional areas). CAREER SOLUTIONS software, databases and support materials are updated annually to ensure that your students/clients receive the most up-to-date career resources. A discount for purchasing, or up-grading, applies for existing customers using other CAREER SOLUTIONS tools. When upgrading from a Single copy to a Network/Site copy, only the difference in price is payable. CAREER SOLUTIONS Software can only be used on one computer at a time, but the software can be removed and installed on another computer at the same site. CAREER SOLUTIONS Software can be loaded onto a single site network and/or onto any number of stand alone computers at the one site. "At last customised job applications and resumes which really work"
"No more standard job application letters and resumes which are almost identical. Now I know what employers really want. They want a positive and willing self-starter who is aware of employers needs. Letters, resumes and selection criteria responses should reflect these attitudes and demonstrate why the applicant is right for the job." "With WINWORK, applicants are helped to create unique, well-written, achievement and benefit oriented letters. But what's even more important is that they understand the principles behind job applications. They know why letters should have a unique selling proposition, and why they should be adapted to meet the specific requirements for each position. That means their letters now look terrific, read well, and demonstrate to the employer the applicant's positive willing attitude and the unique contribution they can make. The added bonus is that I no longer waste time editing drafts. Applicants can Screen Preview letters, resumes and selection criteria responses on the computer before printing. Now the applicants themselves are in control of the whole process. And the feedback I have received from excited students and private clients has been great. Now they all get calls for interviews. Because of what they learnt while completingWINWORKtheir confidence and interview performance has also increased, and the job success rate has leaped."